Very much at the budget end of the Volkswagen spectrum, the Fox competed against city cars like Ford’s Ka. 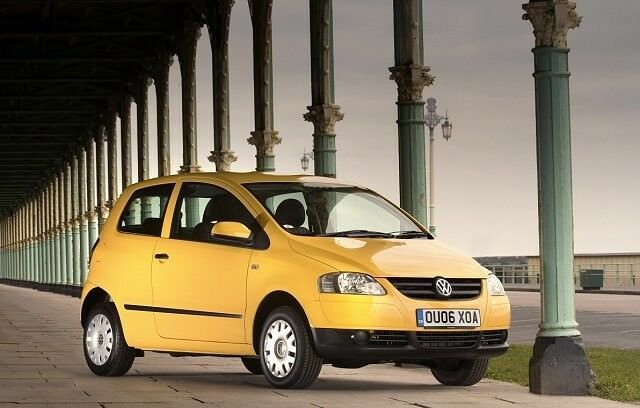 Replacing the Volkswagen Lupo in 2005, the Fox sits under the Polo in the line-up. Very much at the budget end of the Volkswagen spectrum, the Fox competed against city cars like Ford’s Ka. Built at the company's Brazilian factory the Fox is conceived as a tough little three-door that’s simple and honest, with very little choice in engine, trim or transmission. Don’t expect the classifieds to be awash with choice, as Volkswagen kept the Fox range simple - a legacy of them being shipped over from South America and a bid to keep the price sensible. There is some choice, just not much. You’ll do well to find anything but a 1.2-litre petrol version. You might find an early 1.4-litre model but the 1.2-litre makes up the majority of what’s out there for sale. That 1.2 is a three-cylinder unit, which makes up for its lack of performance with enthusiasm. The early pre-2010 cars offered 55hp, with post-2010 models swelling to a heady 60hp. Neither the earlier or later 1.2 will have you breaking any land-speed records, but they do offer decent economy as a pay off, and as a result will be inexpensive to own and run. Like its key Ford Ka rival the Fox is a three-door hatchback only model, though unlike it there’s decent space in the rear seats, which was available optionally with a sliding function to give either more boot space or rear legroom. Unusually, Volkswagen Ireland's dealers denied customers the very cheapest offering from that Brazilian plant, so as a minimum all come with body coloured bumpers and door mirror housings. The interior is as robustly built as the exterior, though the materials are not quite up to the tactile standard of Volkswagen’s norm, but still a good bit better than some of its budget competition. Don’t expect flair; instead enjoy its solid, honest feel and drive. The Fox lacks the appeal of its cute Lupo predecessor or the up! replacement. Good luck finding anything but a 1.2-litre car, as it’s all that’s really out there. The super-rare 1.4 isn’t worth finding anyway. It might not excite, but the 1.2 three-cylinder Fox is about as sensible as small car motoring can be, particularly as it’s actually a good bit more spacious than its natural rivals. You’ll likely spend more on the Fox than its competition due to the strength of that Volkswagen badge, but conversely it’ll be worth more when you decide to move it on. It’s difficult to get excited about the Volkswagen Fox, but then again it’s also difficult to make a rational case against it if you need an inexpensive urban runabout that’s able to take on big car duties once in a while. It’s slow, but the 1.2-litre engine is willing enough and won’t punish you at the fuel pumps. Small enough to park anywhere, yet it’ll carry four adults in relative comfort at the same time, the Fox is a sensible used car choice.